Yamagami-san, at what point did Monolith Soft show you the initial plan for Xenoblade Chronicles? It was before the final stages of the development of Disaster: Day of Crisis. The head of Monolith Soft, (Hideyuki) Sugiura-san5 told me that they had a new project in the works, and then before I knew it, I was being shown the model. 5Hideyuki Sugiura is the Representative Director of Monolith Soft. 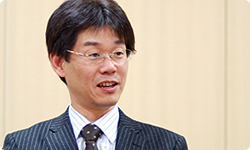 After retiring from Square (now Square Enix), where he had worked in a number of roles, including as a producer, he founded Monolith Soft together with Tetsuya Takahashi in 1999. So you were at a juncture in the development of Disaster: Day of Crisis when it perhaps wasn’t the best time for new proposals, and then out of nowhere you were faced with this model. What was your first impression? I wasn’t aware that he had this approach to making games, so I was initially rather taken aback when I found out that nothing was really fixed aside from the model. But even so, this model was really appealing. Leaving aside the fact that nothing had been settled upon with regards to the game system or story, just catching sight of this model really made me feel charged with energy, and I thought: ‘I really want to make a game with this as its stage’. Yes, that’s true. (laughs) So I really wanted the scenario and the most important elements of the game system to be decided upon right away, before we entered the prototype development stage. But as the development of Disaster was in full swing, it really wasn’t the moment to be coming up with plans for a new project. In order to get a project started in earnest, the ideal way is to come up with the plans together with other staff members. But as they were committed to other projects, we were limited in what we could do. So although the model was made at an early stage, a substantial amount of time passed without any concrete plans appearing. When did work start on the prototype version? We started work on the prototype in April 2007. To coincide with that, I got Yokota-san and Hattori-san from the Software Planning & Development Department involved in the project. Yokota-san was a real RPG expert, and I asked him to look at system-related issues in particular, while also combining with Kojima-san from Monolith Soft to work on the project’s overall direction. Hattori-san had experience of writing scenarios for Nintendo titles, so I asked her to take a step back and look over the scenario that Takahashi-san and (Yuichiro) Takeda-san6 had written from an objective standpoint. 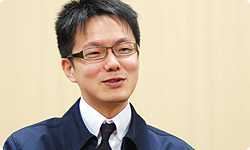 6Yuichiro Takeda is a scenario writer who, in addition to work on animated features, was in charge of creating the scenario for Xenosaga I & II for Nintendo DS. 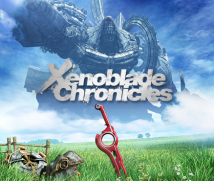 He is interviewed in Iwata Asks: Xenoblade Chronicles, Volume 2: Story. Yokota-san, what was the first impression you had of Monolith Soft? Well, I’d been a huge fan of their RPGs, such as Xenogears7 and Xenosaga8, so I thought: ‘At long last, I can meet Takahashi-san!’ (laughs) 7Xenogear is an RPG released by Square (now Square Enix) in Japan in February 1998. 8The Xenosaga trilogy was a series of RPGs released between 2002 and 2006 in Japan. Developed by Monolith Soft, they were released by Namco Bandai Games. No, as you might imagine, I couldn’t quite say that! (laughs) I was incredibly nervous. But I remember that I joined just as work was finally getting started on the prototype version, and the details were a long way from being finalised. I felt incredibly excited to be taking part in the discussion of how things were going to proceed. And what was your first impression, Hattori-san? To be honest, when I first met Takahashi-san, my impression was that he was rather guarded. (laughs) That wasn’t due to it being Hattori-san, or because it was Nintendo. I do actually tend to be rather guarded when I meet people for the first time. But as soon as I realise that I can work with this person, my attitude changes completely. But you know, I don’t think I’ve really got a handle on him yet either. So even Kojima-san, who works alongside him thinks the same!